When I'm away from her, I'm thinking about the next time I'm going to be near hear again. When I'm with her, I can't get enough of her. I want everything she has to offer. I want her body. Her soul. Her love. I want every breath she takes, every moan she whimpers spilling from her lips because of me. "I love you, Jillian," I whisper into her hair. I'll kill her before I let her leave me. Holy. Wow! I think I'm going to need a minute to gather my thoughts after having read one of the most intensely emotion-stirring motorcycle club romances I've ever come across. 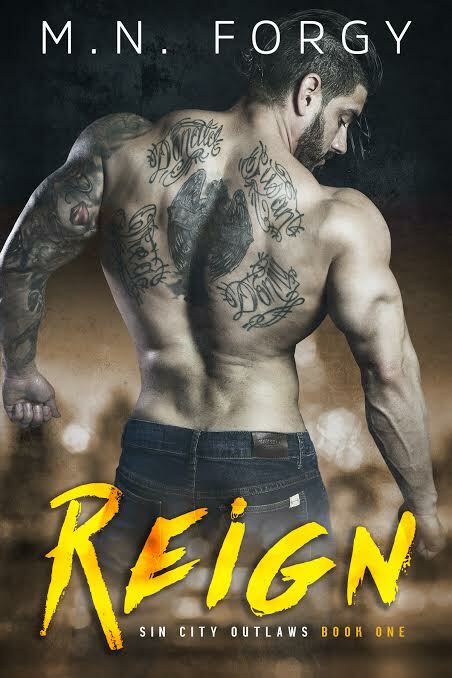 Reign is not only the Sin City Outlaws series starter, but it also happens to be my first ever M.N. Forgy read. This is a spin-off of her much-lauded Devil's Dust series, which is now on my to-be-read list after that cliffhanger of an ending and the mentioning of Zevin "Zeek" DeLuca's younger brother, Phillip aka Lip. That being said, I was able to read and fully enjoy Reign even without having read the first series. My curiosity, however, has been piqued and I'm looking for more of the back story and since I'm unsure of how long I'll have to wait for the second book to land in my already eager hands, I may as well find out all I can about the Devil's Dust MC. M.N. Forgy doesn't sugarcoat as she introduces readers to the Sin City Outlaws and the world they live in. They're vicious killers who do not seem to have an iota of remorse or guilt running through their veins. They live for the violence and mayhem that they wreak within and beyond their territory and there's a very real reason why law enforcement receives tailored training for this particular motorcycle club. Zeek DeLuca has been at the helm as president since the death of his father in prison six years prior, but the club isn't what it used to be, being used more as lackeys and enforcers by his casino-owning, mafia-connected uncle than anything else. However, they're still feared, even by those who have vowed to uphold the law. The only one who appears to be quite willing to stand up to them is Deputy Jillian Adams. If you're looking for chemistry, the main characters in this book have it in spades. So palpable is the chemistry, that there's no question that Zeek and Jillian are going to get together. What makes it so damn interesting, though, is the thought that Zeek is exactly what he is--a law-breaking biker who isn't afraid of anybody--and Jillian is a member of the sheriff's department. They know how huge of a mistake it would be for them to even contemplate hooking up, what more actually developing deeper feelings for each other that go beyond the mutual distrust, curiosity, and lust that they start out with. And then there's the fact that Zeek has never been in any sort of actual committed relationship with any woman, and he's torn between his want and need for Jillian and the knowledge that she deserves better. See why it's intriguing? Learn more about M.N. Forgy. Purchase Reign on Amazon | B&N | Kobo.